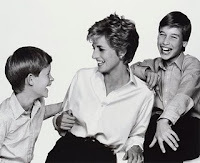 Diana´s most prolific dress designer, the late Catherine Walker, had absolutely no formal training in fashion design when, widowed with two small children, she began peddling clothes out of a basket in the Chelsea neighborhood of London. King´s Road, the main boulevard, is known for its atypical and pricy boutiques and is where Mary Quant´s mini-skirt first debutted in the 1960s. Catherine was to become "the" designer who launched Princess Diana from a shy, awkward, gangly girl to a 1980s and 90s fashion icon. On June 23, 2011 at 7:00 p.m.14 of Diana´s dresses will go to auction at Waddington´s in Toronto, Canada. Diana herself, at the suggestion of her son, Prince William, offered these same dresses among the 79 original dresses that were auctioned off at Christie´s New York exactly 14 years ago, raising over 3 million British pounds (approx. US$3.6 million) for various AIDS and cancer charities. You can see the 14 dresses in detail online. and future king of England, Prince William. Diana. Imperfect and emotional. So very human. Arguably the most loved princess in the history of the British Royal family. A Cinderella story gone awry, stripped of her royal title after the inevitable divorce from Prince Charles. Her flaws and misfortunes only made us love her more. She was "one of us". She was "The People´s Princess" and as stated by her brother in 1997 after a tragic accident took her life on the streets of Paris, "...she needed no royal title to continue to generate her particular brand of magic."